Julia: she created this hairstyle all on her own. Just a short check in today. Is this week almost done yet? Ok internet I have a cat story for you. My cat Rosebud had a bit tummy trouble a week or so back. Only for a day. Well THAT ONE DAY was enough to convince our cat Sally that she now hates Rosebud with an undying and fervent passion. She's decided that she has to attack Rosebud whenever she sees her. We've had to separate them. We had to get a 2nd litter box. (nooooooooooooooo) They can't sleep in the same room anymore. Rosebud hides from Sally under the bed all day, if we don't lock one of them up, and we have to let them out in shifts. Have we called the vet? Uh no, not yet. I'm calling them today. We tried following some online advice about how to re-introduce cats to one another, but nothing is working thus far. Has anyone ever had this happen to them??? I didn't think it possible for my clothes eating, man stealing (she's Andrew's cat wife) cat Sally to be any more of a pain in the potato than she already is. I WAS WRONG apparently. Poor Rosebud. We feel so sorry for her! Very sad about Sally and Rosebud (great names, btw) and so sorry I have no solution for that. But, great photo! sigh. those cats. Sally eats our clothes. She wants to kill the other cat. She's on paper the worst cat ever. Except she's the sweetest thing in the world! Isn't the hair so cute? :) Oh MAN I was hoping you'd have some magic knowledge!!! oh well. today's actually been a good day -- only one hissing cat fight we had to break up. I wonder if Rosebud might not still be sick with some underlying illness? Animals seem to know (smell maybe?) when other animals are sick and seem to want to remove the weaker animal. I'm curious what your vet has to say. Hopefully the problem just resolves itself! I love it. Did she make that star? 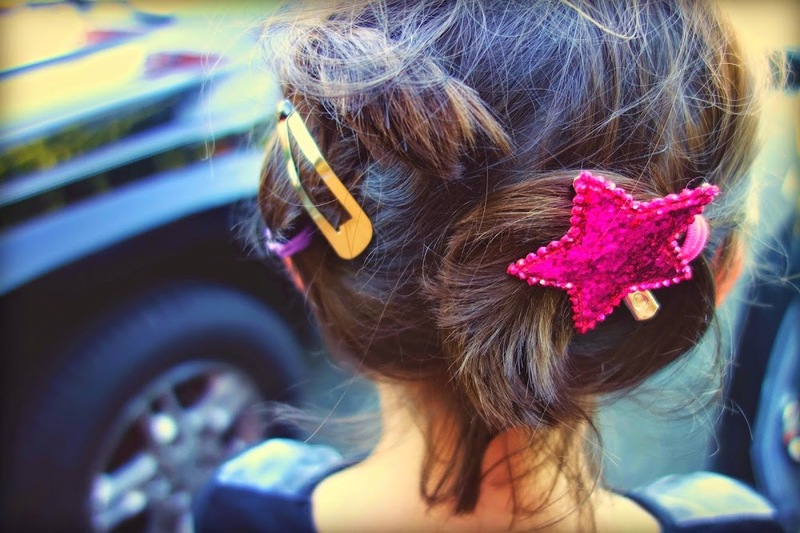 no that's a little barrette, she has one in silver as well! :) yeah.....no one knows quite what to do with these wacky cats. Kitty cat prozac??? Beautiful hair! Miss J is creative in that aspect too! Poor Rosebud. I hope you will find a solution soon.